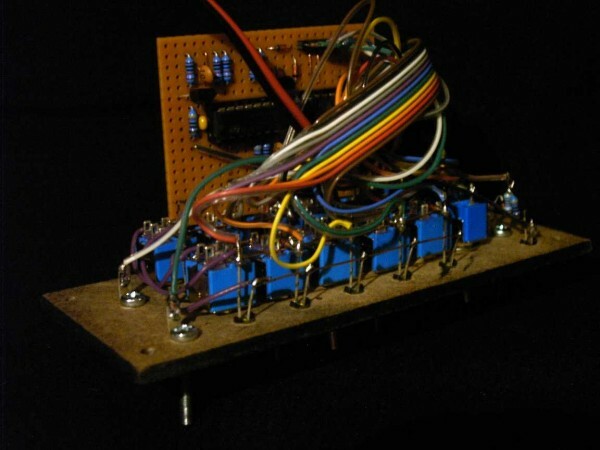 A simple gate sequencer based around a CD4017. Using toggle switches with center position to choose between on/off/reset for every step. steps in a row are turned on. It's actually a variation on the double pulse swing divider. it is so simple with this gate / reset combi switch - i realy like it. why are you using this Transistors at the inputs? Using the switches is also much more practical than a rotary/slide switch. to buffer both the reset and clk inputs. But they are inverting so the transistors take care of that too. I just noticed it says 5V in the schematic, must be a leftover from what I adjusted it from. I'm actually using 12V most of the time. What does the 100pf on pin8 4093 do..is it a delay to null the 4017 latency? And from that my concern, the short switch will allow clock PWM to pass? I got some problems getting double pulses, which I think was caused by the 4017 latency so yes that's what the 4K7 resistor + 100pF cap is for. I kept it very small and it works well into (and maybe beyond) the audiorange, so PWM shouldn't be a problem. I added another switch to the circuit so it can loop or run once. Ken Stone's got a couple of ideas round the reset which might interest you to implement. A reset and hold feature and a power on reset. I love this, really elegant. 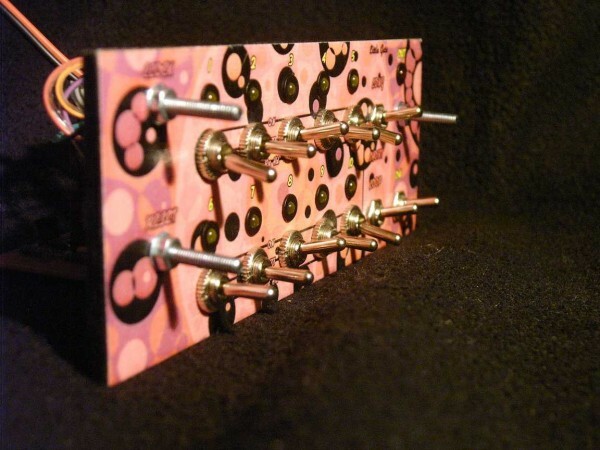 I was trying to do something like this but was going to be using two sets of DIP switches (one for on/off and another for reset). This switching idea is much more elegant though. I just spotted some three position slide switches at one of my usual suppliers too! 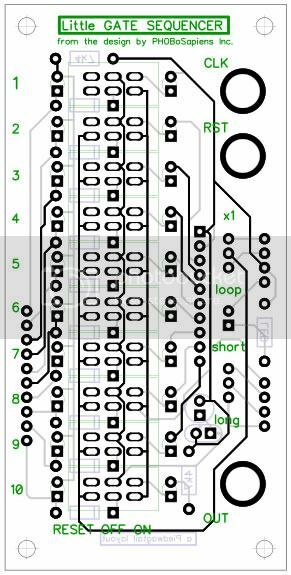 I got some switches to put this one together but when looking at the schematic I noticed I made a mistake. to light up at the same time. 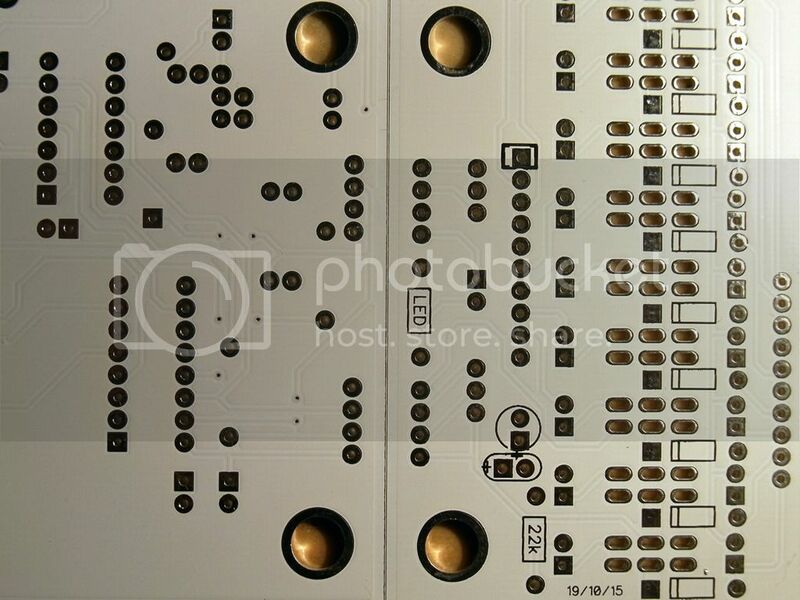 The correct way is to connect the diodes only to the switches and not the LED's. reset behaviour where it would sometimes skip the first step or bounce between a couple of steps before continuing. the second probem, which it didn't. disconnected the wire from the divider it still wouldn't run untill I removed the patch cable completely. that would make any difference, it didn't. So next I reduced the pulldown resistor on the base of the transistor. to bring it down to 1 value) The total resistance on the inputs is a bit lower than usual now. how I wired it up to make troubleshooting a bit easier. Debug! Like this single resistor value idea; the 10K10step; but it's a rigor that would take space.. When I looked at this last, I was thinking about DPDT center-off switches and using the other pole to switch on programming leds and come to think of it an end of loop led(in the previous step column/position), whilst also having the run leds. >9V which some types can only stand for a short time. At least for 15V I would spend the extra 7 Rs. see what is more natural. 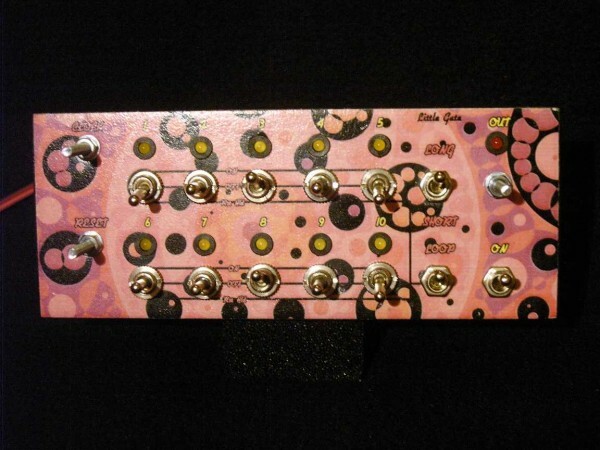 the 4017 outputs + CLK, so you could add more modules with switches (gate sequencer) or pots (CV sequencer). but better safe than sorry I guess. I used 1 common resistor because it's easier to wire up. I only had problems with modern high intensity white an blue LEDs ( which I use as low current LEDs with 1..2mA ). @ 15V (test only)supply voltage the reverse operated LEDs immediately shorted my fortunately current limited power supply. LEDs were not destroyed but damaged and showed a perament resistance in both directions and much less light output. With old stock red and green LEDs this did not happen; they had about 10..20 uA reverse current which does not kill them. Red=steps, Green=ON which would turn yellowish when current step is ON. Had me a little confuddled until I realized you mean 3 pin Bi-colour Leds not 2 pin! Yes completely agree; using step length polyrhythms is simple to set up and the results are intriguing. So if I understand you correctly what you are saying is that if I understand maximum current and power dissipation limits and don't gratuitously abuse unbuffered inverters by trying to use them as op-amps I can enjoy all the advantages the extra voltage headroom allows and still be free to power a real op-amp mixer and a small audio amp as well. Well, why didn't you say so right off! 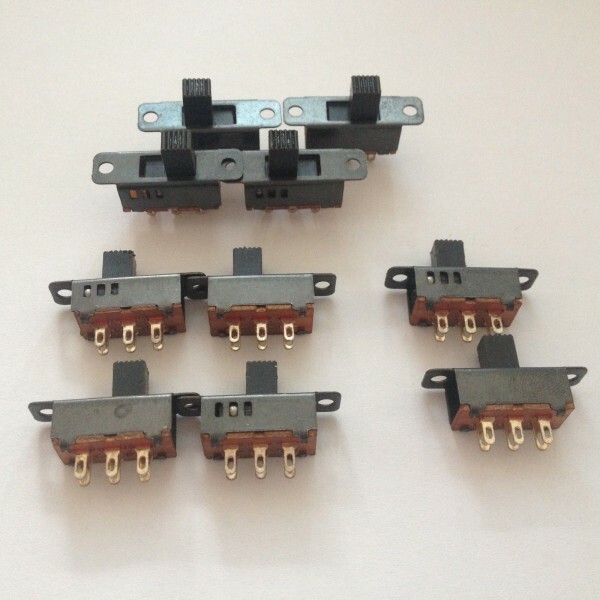 I just bought these (see attached)10 for £1.92, which were far cheaper than toggles and I hope a little more heat resistant than the cheapest Chinese toggles can be when soldered. I figure solder mounted above the pcb, I can use the holes(maybe expanded) to hold the programmed and run leds (or run/program and end of loop leds).They are center off. Can't remember my exact working, but I remember simulating it and it being solid. It maybe needed another chip though as the short/long part has to be made separate for each step. I remember playing around with some diode logic, but I can't remember if anything came of it. in fabrication today with a second cpu board that affixes to rear! those switches above with 2mm running leds to left 2mm step leds to right utilizing the fixing holes. is it euro sized ? 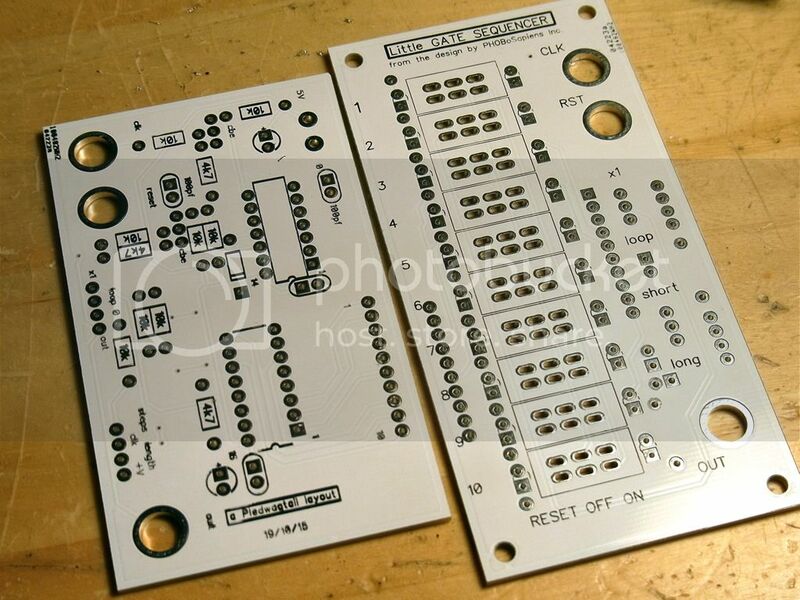 I've shied away from eurorack because it's so 1/8" jack centric and because pcbhouses have a standard price for 100x50mm. I know this isn't a lingerie and beauty forum, but these are pretty! silkscreen isn't the best I've come across - smudgy and weak in places. Very nice, you chose luxury by going with a coloured silkscreen! Not quite luxury....luxury would be green silkscreen on white pcb, like in the printout... . I believe some fabricators will do that. I like the white because it makes the components look colourful and the lineage back to the slider caps on the Odyssey Mk.1 and the clean industrial design on first synth I dissected- the SEM. These were made at Smart Prototyping, but as mentioned the black silkscreen isn't the best. Itead has been better. Cost vs speed vs customs efficiency are other factors.